Goldfish Crackers for carnivores! Thank you Cee! Happy Thanksgiving, everyone who celebrates it! I had a (literally) last minute idea for a Thanksgiving picture, which I have placed on the Discussion Forum (linked at the top of the site). Pop on in for some extra Holiday goodness! That Smile was adorable and kind of scary all at the same time. This is still my favorite page! I just wanted to say that I just read everything in one sitting. This is a great story you have going here. I love how honest it is and how pure the humor is. I can’t wait to see where this goes! Dave, You gave me a laugh too! I LOVE the 6th panel! “EEEEEEEEEE” indeed! ROFLMAO! -pats Todd’s shoulder- I’m sorry to tell you this but she’s gone to the dark side of women. Oh my GOD so adorable. Ah, and Selkie has discovered the joys of shopping! Cripes, panel five. That look is cute, but so darn creepy! I actually got goosebumps! How does she CARRY that many clothes? That’s nothing. I carry more weight daily in books and papers and pencils. 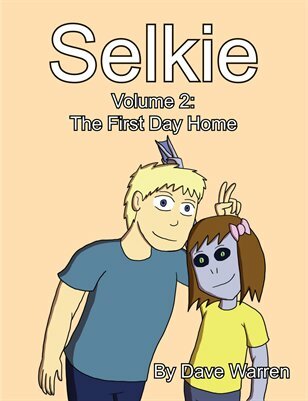 Oh my~ haha, Selkie looked adorable in panel 6! “Mule” … how perfectly appropriate! Panel 5 is my favorite on the cuteness factor. But seriously, her expression in it should have tipped Todd off to the trap he was about to step into. Oh! 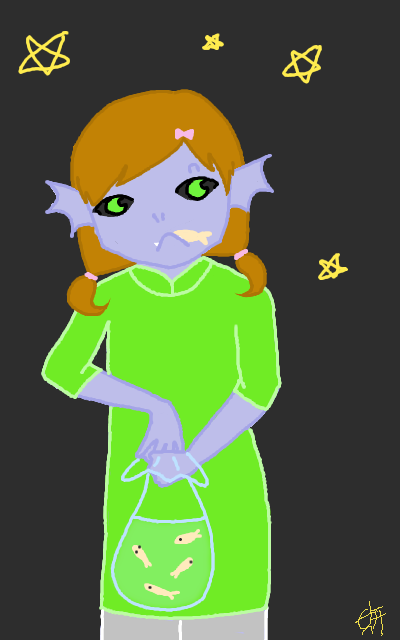 And Happy Thanksgiving from Shards to the cutest fish girl we know! Happy Thanksgiving Dave! Here’s to more strips, more pinups, more fanart, and definitely more readers :)! Actually, I begin to wonder of the other residents of this town that they do not give Selkie a second look, or even a first. Is it a town where weird stuff happens frequently? Like in some anime? The last 5 panels are your most expressive work yet, I look forward to moar! Also, nice touch having Selkie like seals. I want a Selkie of my own~!! Hmm, I wouldn’t be surprised if she uncovered a few kids hiding within the clothes racks xP. Hell, I did it all the time. He’s a new dad, he’ll learn how to read her expressions from incidents like this. I play an on-line game called “AdventureQuest”. One of the potential opponents in the game is a “Selkie”; after you defeat it, it changes from a ferocious creature to a harmless (and rather cute) seal. As for everyone else’s reaction, I’m guessing this is a land where kids like Selkie aren’t uncommon, and are at least accepted, if nothing else. One last remark on the expressions … can’t you just see her hatching her “evil” plot in panel 4, launching it in panel 5, and celebrating in panel 6? Next: Selkie gets a wardrobe of different dresses- different cuts, colors, fabrics- all they have in common is SEALS. Also, Ted will shortly be subjected to a fashion show. Like, NOW, based on Selkie’s last mph. nice refrence to the real life folklore of the shape-shifters called selkies. for those who dont know, they are(in a nutshell)seals who take off their skin to become humans. that is in fact the reason i even found this comic, i’m huuuuge into shape-shifters, i thought this would be about them or some form of shape-shifting, but i do still enjoy it without those qualities :p keep up the good work! Selkie….why are you so CUTE? WHY? Cute! One of my favorite yet! I am enjoying following this comic so much. !!! She’s so cute, and I see some back story is starting to come out. ! FANART… I think i want to do fanart. ….